1. Mortar, stucco, and dust created from block cutting are all messy. Don't let it accumulate and dry in spots visible at the finish of your project. You'll be much happier if you clean up after each work day. 3. Read through your construction plan and take some time to really look at and study the CAD drawings. You'll save time in the long run. 4. Fire logs, like Duraflame, are a great way to enjoy your fireplace for hours uninterrupted. 5. Gas fireplaces, although a bit more expensive give you the quick on - quick off capability. And they're super clean. 6. Clean your tools at the end of each workday and even as you go. Dried material can be stubborn to get off later. For flat tools such as trowels, a light tap with a hammer will many times loosen dried mortar and stucco. 7. For firebrick installation make sure you dry fit the bricks for pattern placement and size before you mortar them in place. 8. If you have a short length level, don't worry! Use a flat and true 2x4 to bridge wide areas and simply rest your level on the 2x4. It's the same result as if you had a long level. 9. If you are thinking about running a gas line to "power" your flame or wiring for external lighting, make sure you think through where the lines will run within your structure. Do some planning and make sure you put the gas and electrical lines in place as you are building. It's easier than installing them at a later time. 10. If you are building in your backyard, sit in your home and look outside. 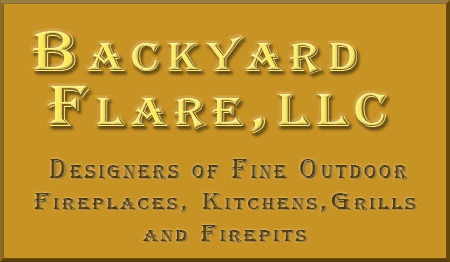 Many times, what may seem like a great location when you are outside may not be the best if you want to see the barbeque or your flame from indoors also. 11. If you have never layed block and mortar do a little research with books or online with regard to techniques. There are also some great manuals and publications that can be found at your public library, as well as at your home improvement store. 12. Invest in some thin gloves that have been dipped in a plastic or rubber coating. They are relatively inexpensive at only a couple dollars a pair. They will help preserve your hands when they would normally be covered in mortar and concrete. 13. Buy a raised fire grate to elevate your wood, logs, etc. This will make for a bigger fire as oxygen will be able to get underneath your flame. 14. For installing firebrick and even some finish materials, you can use a caulking gun type construction adhesive instead of mortar. For firebrick, you can also use a clay mortar but it may not have the same "stick" factor as the high heat construction adhesive on the market today. 15. For seating, mantel rows and to top your chimney, you can use natural material which will tie all of these parts of your fireplace together. It makes for a great look sometimes. 16. You can use an industrial sized (and strength) cake decorator bag to apply mortar or grout between finish blocks. It does make the job mush less messy.